One of the best reports i've seen of an avalanche incident and hit me heavier than usual that it could've been any one of us, especially due to the increasing traffic the whites have got this year. Avalanche terrain or not, be observant, look out for everyone, and ski with your friends. Hoping to pass it alone so we can learn and make the best decisions possible! Absolutely brutal. puts into perspective how hard an avalanche hits. I assume the probe strike was around 2:18 and even though he was only 1.2m down, it took a full 15-20 mins to dig him out. It really shows the energy you have to commit just to dig that deep. Anyone else have sites that do similar analyses piece on accidents? Really scary especially coming from the east (which so many people consider safe). Shows that avalanche gear means nothing without a partner and the backcountry, no matter where, can be unforgiving. Damn, feels like I just watched a super sad drama after reading that. I really appreciate that the post was super detailed. It will be great learning for others. Was in tuckermans or was it another place on the mountain? TRVP_ANGEL Absolutely brutal. puts into perspective how hard an avalanche hits. I assume the probe strike was around 2:18 and even though he was only 1.2m down, it took a full 15-20 mins to dig him out. It really shows the energy you have to commit just to dig that deep. 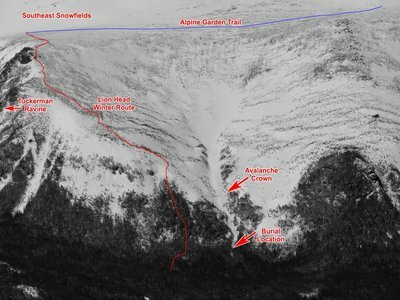 Any regional avalanche center website in the united states will have an accidents and reports page. All great to read for learning purposes. AAA also sells a book/encyclopedia of all major avalanche incidents in the US. Shred-Sausage Was in tuckermans or was it another place on the mountain? He was in a different spot on the mountain. See the picture I'm attaching to my post. "One other notable factor in this accident was the fact that at least three parties observed and later reported seeing what appeared to be a fresh crown line in Raymond Cataract. No one made the 5-10 minute diversion to look for clues or do a beacon search of the debris where a ski and pole were on the surface 75’ uphill of the burial site." Really want to highlight this quote from the accident report. Somebody on TGR's facebook the other day was trying to arguing that he died from injuries and having a partner or equipment wouldn't have been useful. Dude was still breathing hours later or whatever. No guarantee but might have been okay if he had gotten out a few minutes. Having a partner and gear is important even on the east coast. Not as dangerous as CO has been but still shows that things can happen even on the east. Be safe out there this spring! B.Gillis "One other notable factor in this accident was the fact that at least three parties observed and later reported seeing what appeared to be a fresh crown line in Raymond Cataract. No one made the 5-10 minute diversion to look for clues or do a beacon search of the debris where a ski and pole were on the surface 75’ uphill of the burial site." Thank you for this, huge takeaway to be observant, from personal experience the Huntington ravine fire road, which would be the closest ski/skin trail to the burial site is a relatively easy and flat skin. Very frustrating to think about how someone could've been there in such little time if it had crossed someones mind as soon as they saw a crown. I had a friend who was there on that day and even had a clear vantage point (it was a bluebird day) of Raymond cataract and didn't notice a thing until he skied down and a helicopter was at Pinkham Notch. theabortionator Somebody on TGR's facebook the other day was trying to arguing that he died from injuries and having a partner or equipment wouldn't have been useful. Dude was still breathing hours later or whatever. No guarantee but might have been okay if he had gotten out a few minutes. Having a partner and gear is important even on the east coast. Not as dangerous as CO has been but still shows that things can happen even on the east. Yeah I believe I saw another article that said he actually died of cardiac arrest and he was indeed still breathing when they recovered him. I'm not familiar with avalanches/backcountry at all. Would this have been some triggered by the avalanche, does that happen? I'm assuming this is the case but dont really see the correlation between the two. Just super high blood pressure after all the stress and burial maybe? Yup, heard about this the day it happened. Mt. Washington is a beast and no matter how good of a skier you are, you always gotta ski with a buddy IMO. One of the things that make avalanches so dangerous is when the snow slides it warms up and creates a slush then when the slide stops it freezes again so you are basically digging through crusty ice instead of soft powder. 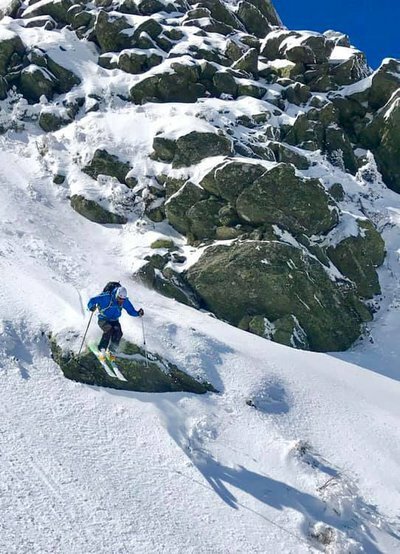 Seriously dude, I use to watch STE videos of guys ripping there and not even think an avy could happen, let alone knew what a beacon or probe was, all I'd bring is a backpack with my avy shovel and a lot if food and water. I'm out in utah now and have already seen what I thought were small slides, that could easily make someone struggle to get out of. Slowly getting my gear and learning just online but an avy course helps a lot I imagine, next year I plan to tour a few times but I'm not doing it alone ever. Really is sad though, just dont expect it in NH really but it can happen, just like in the park, make sure the guy who dropped before you gets down and out of the way safely, even if you dont know them, sounds like this guy couldve beem easily saved, but my God that's a devastating avy path, looks like it would've gone had a snowball been thrown at the ridge. The situation is tragic, but definitely could have been avoided - all of the above lessons are straight from AST 101. GrandThings Yeah I believe I saw another article that said he actually died of cardiac arrest and he was indeed still breathing when they recovered him.